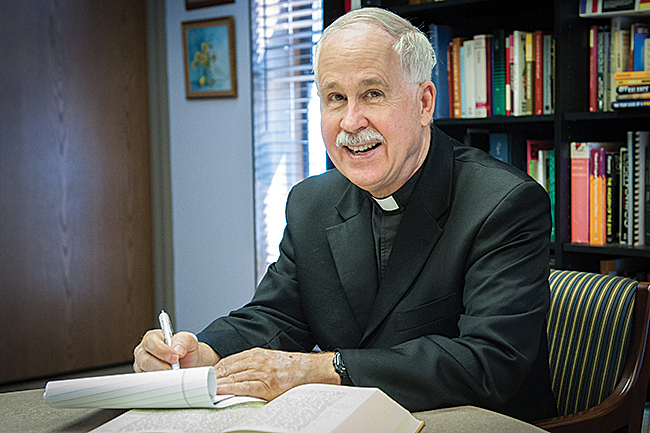 Father Mike Stubbs is the pastor of Holy Cross Parish in Overland Park and has a degree in Scripture from Harvard University. This word is derived from the frequent outbursts that the prophet Jeremiah made against the enemies of Judah and Judah’s leaders. We overhear one such outburst as Sunday’s first reading, Jer 1:4-5, 17-19. Jeremiah hears the Lord telling him: “A prophet to the nations I appointed you.” Through Jeremiah, God is sending the nations neighboring Judah, not a message of salvation but, rather, a rebuke and a prophecy of doom. Even though these gentile nations at times might act unwittingly as God’s agents in punishing Judah for its sins, the gentile nations themselves are also guilty of sin and thus deserving of punishment. These oracles against the nations will appear in chapters 46 through 51. Besides castigating the gentile nations, Jeremiah also directs his attention to “Judah’s kings and princes, against its priests and people.” He criticizes them for tolerating the worship of false gods and for their political decisions. Throughout his career as a prophet, Jeremiah constantly spoke out in condemnation of others. His messages acquired for him a long list of enemies. To withstand them, he needed a considerable amount of moral strength. That is why God instructs Jeremiah: “But do you gird your loins; stand up and tell them all that I command you.” The gist of what God is telling Jeremiah here is “man up.” Someone would gird his loins, that is to say, pull up his robes around them, in order to do physical work or to fight. This last seems more likely for Jeremiah. The words that God speaks to Jeremiah can also encourage us as a church whenever we deliver difficult messages to the world, when we speak out in support of human life, when we advocate on behalf of refugees, when we point out dangers to the environment.